My desk at home faces a large window that looks out into my backyard. The yard is bordered on the east by several 50 year old, blue spruce trees, on the north by a line of 20 year old eastern hemlocks, and on the west by a row of 40 year old arbor vitae. There is also a scattering of scarlet oak, red maple, crab apple, and black locust trees and a leaf-covered basketball court with a slightly leaning pole and backboard. Many birds utilize the shelter and cover of these trees for roosts and nesting sites. One particular bird (or pair of birds, actually) that I have been watching out back are two northern cardinals, male and female. They paired a few weeks ago. The male’s bright red plumage and his energetic singing along with his selection of (and ability to keep!) this prime, tree lined, back yard area must have made him irresistible to the female. He frequently sits on the apex of the basketball backboard and sings his crystal clear, “birdy-birdy-birdy” refrain. About a week and a half ago the female began carrying long pieces of dry grass, short twigs, and shreds of leaves into middle branch of one of the spruce trees. She appears to be building the nest on her own, but the male does stop singing occasionally to drop in to check on its progress. The female follows the same pattern each time she approaches the nest. She flies to a branch on a spruce tree near the nest spruce and sits for nearly a minute waiting with her piece of nest material clutched in her beak. She sits quietly but flicks her head quickly in all directions apparently looking for any followers or observers. After this waiting period, she then flies up into the cover of the nest branches and, I assume, adds her material to the forming nest. In a period of a hour, I have seen her repeat this arrival, watch, and entrance cycle five to six times. Once when she arrived at her pausing perch there were two blue jays busily fussing at each other up in some of the higher branches of the nesting-spruce. The female sat on her waiting perch for several seconds but then dropped her long piece of grass (the only time that I saw her do this!) and flew away. After a few minutes, the blue jays moved noisily on, and a few minutes later, the female cardinal returned (this time with a short stick in her beak), paused the requisite minute on her waiting perch, and then flew up into the nest site. Blue jays are notorious nest predators and will eat both eggs and nestlings. The behavior of the female cardinal seemed to recognize the seriousness of the presence of the jays. Yesterday, three cowbirds (one male and two females) landed in the branches of the nest-spruce. Cowbirds are “nest parasites” that affect over 200 species of song birds in North America. Female cowbirds lay their eggs in active nests of other birds and leave them to be incubated, hatched, nurtured, and fledged by the “host” species. The rapid development of the cowbird eggs (2 to 3 days faster than most other song birds), the size and aggressiveness of the cowbird nestling (which can lead to their preferential feeding by the parent host birds and even to the possible ejection and death of the host’s own eggs or nestlings), and the incredible fecundity of the female cowbird (from May to July a female can lay 30 to 40 eggs!) all result in robust cowbird reproductive success at the expense of a wide variety of song bird species. The Audubon Society ranks cowbird nest parasitism alongside habitat destruction as the key causes of song bird population declines in North America. Cow birds evolved in the short grass prairies of North America. They followed the great herds of bison and fed on the abundant insects that teemed around the great beasts. The almost daily mobility of the bison herds made established nests a great hindrance and favored the evolution of the cowbird’s nest parasitism behaviors. When European settlers began cutting and fragmenting the great eastern forests of North America they inadvertently opened corridors for the cowbirds to expand their range. Even today cowbirds tend to concentrate themselves along forest edges and do most of their damage to songbird nests that are placed near the exposed edges of woodlands. Songbirds are classified as “Acceptor” or “Rejecter” species relative to cowbirds. Acceptors are more likely to be smaller birds (like phoebes, sparrows, warblers, and vireos), while Rejecters tend to be larger birds (like robins, blue jays, or cat birds). The Rejecters can use their large beaks to push the cowbird eggs out of their nests. Nest placement is also quite important in this Acceptor and Rejecter dichotomy: nests that are more hidden or located more deeply into a forest habitat tend to have much lower rates of cowbird parasitism. 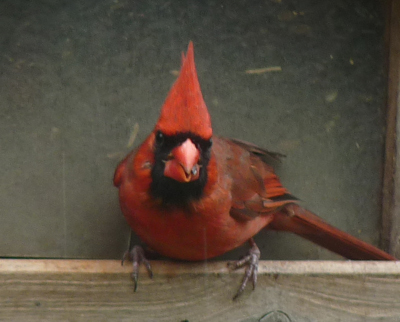 The cardinals, though, who have been so vigilant against the blue jays, did not react to the presence of the cowbirds at all. There seems to be little innate awareness of this relatively recently developing threat to the health and success of their reproductive efforts. I will watch the cardinal nest and see if a cowbird nestling hatches (or if any eggs, cowbird or cardinal, show up on the ground beneath the nest). I will keep you posted.